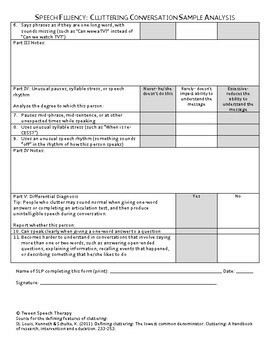 This form should be completed by a speech-language pathologist using information gained from obtaining a conversational speaking sample. 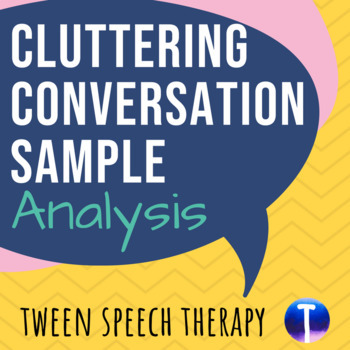 It cannot be overemphasized that the sample must include conversational situations in which the child can speak freely and naturally, because cluttering may not present itself in structured speaking tasks such as standardized testing of articulation or language skills. Audio or video recordings are very useful because they can be analyzed later. It’s suggested that you aim for at least a 5-minute conversation. 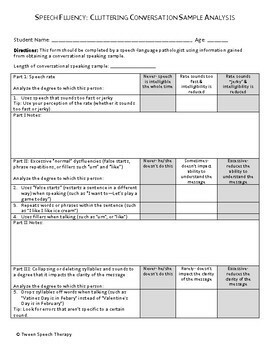 Use the “notes” sections to write down examples of each symptom, the number of times a symptom occurs, or any other observations you have.